The euro-area economy got a modest lift on Wednesday as activity in services came in stronger than anticipated at the end of the first quarter. 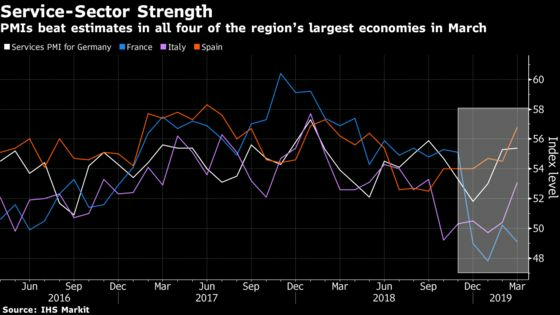 Purchasing managers’ indexes for the region’s four largest economies provided some much-needed good news that helped to push the euro higher. Italy and Spain beat economists’ forecasts, and March readings for Germany and France were revised up compared with flash estimates. Retail sales for February rose 0.4 percent, topping the median expectation. A slump in global manufacturing has dealt a severe blow to the euro area’s export-heavy economy, with Germany in the midst of an industrial recession and France dealing with additional disruptions from anti-government protests. The weakness could yet spread from factories to services, further undermining confidence and broader prospects for the region. The headline services gauge for the euro area jumped to 53.3, the highest since November. That lifted a composite measure for manufacturing and services to 51.6 -- better than the flash reading but still lower than the previous month. The figures from Europe followed bright news in Asia, where China’s services PMI jumped to the highest since June. Stocks rose, also boosted by optimism that the U.S. and China will reach a trade deal as talks resume in Washington. The euro gained 0.3 percent to $1.1239 as of 10:38 a.m. Frankfurt time, and Italian bonds advanced. But the composite PMI still points to a first-quarter expansion of just 0.2 percent, lower than the median estimate by economists in a Bloomberg survey. And despite the upward revision in France, the services number is only 49.1, below the 50 level that divides expansion from contraction.